This is what I am going to get when I go back to the States. If I don't get it, I will...get crancky n go nuts n go on strike. it is not stuffed! and it stays that small FOREVER. It's a cross between red poodle and another kind of dog. 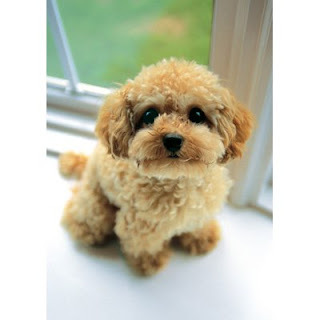 In Taiwan, it is called "Red Poodle Teddy Hound." HA HA HA! It looks stuffed to me too XD. I can so see you with that dog in a cute bag taking it with you all over the place!